Those black suits. Those weapons. Martial arts. The image of the ninja is rooted more in fiction than fact. Everything you think you know is probably more “wrong” than “right”. This article was originally published on August 7, 2012. Ninja most certainly did exist in Japan, but they were more about information—and disinformation—than just assassination. Yes, there were ninja assassins, but as Ninja Attack author and game localizer Matt Alt points out, what percentage of CIA employees are trained assassins? In Ninja Attack, Alt and co-author Hiroko Yoda examine the historical ninja. (Full disclosure: Tuttle, which has published two of my books, is republishing Alt and Yoda’s book.) “A 15th century ninja would laugh out loud at the sight of a dude in black pajamas running around a modern city,” says Alt. 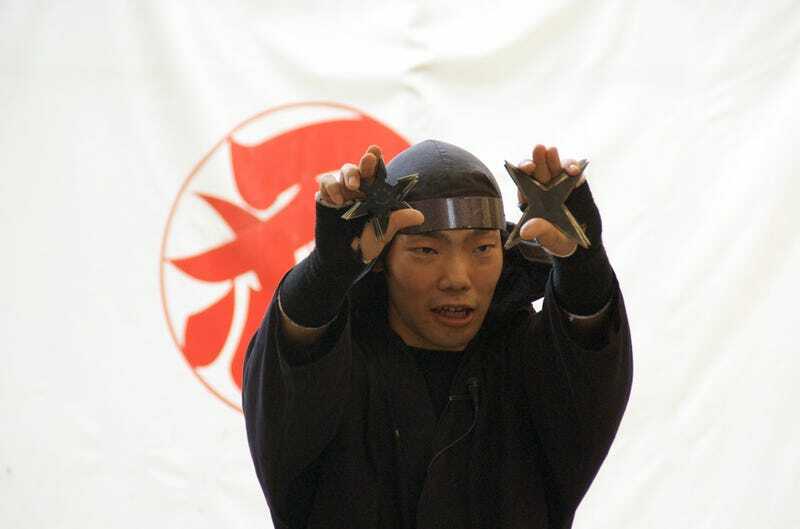 “The whole point of a ninja was to blend in.” Ninja often dressed as farmers so they could do just that as they collected information and scouted enemies. Explains Alt: “Imagine that the year is 1600. Two of your enemies are fighting a battle, so you send a couple of guys dressed as farmers to the area to watch the battle and report back to about what’s happening. That’s ninja work.” A perfect example of this can be found in the classic Akira Kurosawa film Kagemusha. And since many ninja dressed as farmers (heck, many ninja strongholds were in rural areas), the weapon of choice was likely the “kusari-gama”, which was a sickle with a chain attached. According to Alt, this weapon was ideal because it could be easily dissembled into farmer’s tools. Remember, the point is to blend in, and nothing is more suspicious than a guy carrying throwing stars, right? Yes, shuriken (throwing stars) existed, but Alt says it’s still unclear how they were used: Were they used to slash? Did ninja flash them and brandish them as a threat? Were they thrown? There’s no historical record of throwing stars being decisive in combat, says Alt. Then there are the swords. It’s unlikely that ninja had samurai swords, because those weapons were a samurai birthright. If a ninja stole a samurai sword, that would be the equivalent of impersonating a police officer and he (or she) would be put to death. Yes, some ninja did have swords that were made in their local villages, but the idea that each ninja carried a standard set of weapons (shuriken and swords) and wore the same outfits (black pajamas) is, as Alt says, “ridiculous”. Different ninja had different purposes, so there wasn’t a set kit for the historical ninja. Like cowboys in the Wild West, ninja lore built up over time. A stock set of iconography came to define the ninja. The ninja as part of Japanese popular culture really started to take off during the 1700s, when ninja characters appeared in books and plays. The word “ninja” didn’t appear until the 1800s—long after real ninja existed. Before that, a whole array of words were used to describe them—from “shinobi” to “A dude from Iga”. Before the 19th century, the notion of ninja was connected more to magic and fantasy. So when storytellers began grounding their ninja in reality, they needed a way to explain how ninja could become invisible. Artist Hokusai gets credit for the first image of ninja in the classic black suit. It appeared in the early 19th century, and it could’ve been based on “kuroko”, Japan’s traditional theatrical stagehands. For Alt, there’s been a hyper focus on martial arts and ninja in the West. In Japan, however, ninja are still associated with spying. The discrepancy is related to how the ninja spread. It wasn’t until fairly recent that ninja were known outside Japan’s borders. In the 1960s, the Bond film You Only Live Twice put ninja on the map in the West; in the 1970s, there was the big martial arts boom, which engulfed the ninja; the 1980s saw American Ninja as well as Frank Miller’s comics; then, of course, there was Teenage Mutant Ninja Turtles. When I say what you know about ninja is “wrong”, I’m using quotes because this iconography, while not historically accurate, was created, refined, and tweaked in Japan. The mythic ninja appears in Japanese manga, TV, film, video games and more. Japan excels at creating memorable characters; along with Godzilla and Hello Kitty, the ninja is one of its best. So, yes, the ninja of popular culture differs from real ninja (and if you want to know about real ninja, check out Alt’s book), but the ninja of popular culture is so vivid and so fascinating, that it’s easy to see why Japan has continued to embrace this mythos.